About two years ago, one of Damian Warshall’s teammates on a Charlottesville softball team came to him with an idea. Now, that idea is being sold in kegs, cans and shops all over Virginia. And no, it’s not beer. Warshall, who graduated from the University of Virginia’s Darden School of Business in 2014; Paul Dierkes, the softball teammate; and Joel Artz started Snowing in Space, a Charlottesville-based coffee business known for its nitro cold brew coffee, in 2016. They opened a cheerful, colorful coffee shop on Charlottesville’s bustling West Main Street last year, but their real reach extends well beyond UVA’s home city and into office kegs, coffee shops, Whole Foods stores and other retail locations in Washington, D.C., Northern Virginia, Maryland, Richmond, Lynchburg, Harrisonburg, Newport News and Williamsburg. That’s rapid growth by any standard, and especially for a startup that has only been in business for two years – and a founder who, four years ago, was working in Washington, D.C. real estate finance, frustrated and eager for a new challenge. Personally, Warshall has come pretty far. He came to Darden from the real estate industry, where he had been eyeing the craft beer industry with interest – and a bit of envy. Once he started at Darden in 2012, Warshall began exploring careers in the food and beverage industry. He took classes on entrepreneurship and leadership, built up his finance and operations management skills and networked with local business owners and entrepreneurs as much as he could. After graduation, he got a job managing finances and business operations at Wild Wolf Brewing Company in Nellysford, where he stayed for 10 months before joining Lumi Juice, a cold-pressed juice startup led by Darden graduate Hillary Lewis. It was during Warshall’s time at Lumi that Dierkes approached him for that fateful conversation on the softball field. Dierkes and Artz run a Charlottesville marketing firm, Okay Yellow, that counts Virginia craft beer titan Devils Backbone among its clients. A few months after that conversation, the trio had perfected their cold brew technique, mapped out a business plan and chosen their name – derived from a Bill Murray quote in the film “Groundhog Day.” In September 2016, Warshall left Lumi to work on Snowing in Space full time. He does a little bit of everything for the business, from managing strategy and finances to purchasing equipment, brewing coffee and making sales calls and deliveries. “When you are a small business, you are involved in everything,” he said. Given his start in the craft beer industry, it’s fitting that Warshall ended up producing what many refer to as the Guinness of coffee. Like the famous Irish brew, Snowing in Space’s cold brew coffee is infused with nitrogen after it is steeped, making it extra smooth and creamy even without any added cream or sugar. It is less acidic than your average cup of hot coffee, but still contains more caffeine per ounce. Snowing in Space sells seven different flavors of its signature cold brew in the shop, in cans and in kegs that can be distributed to offices or retail locations. 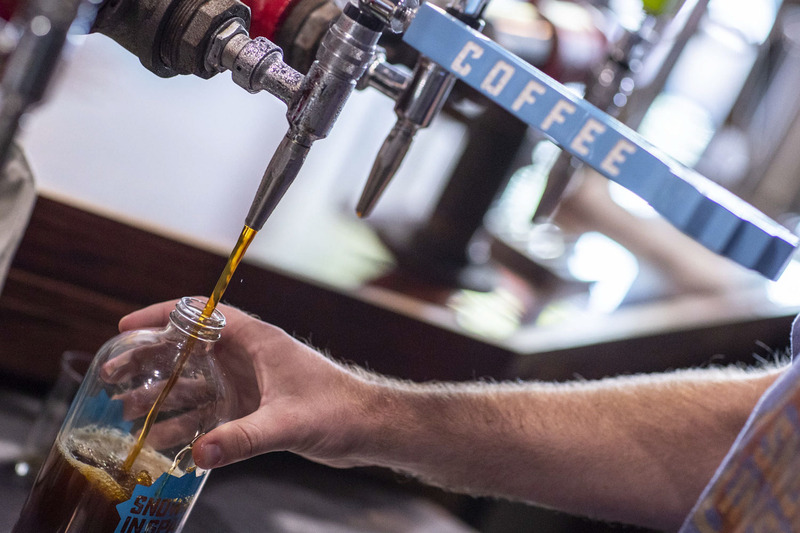 The company gets all of its beans from local coffee shops in areas that it serves and transforms them into cold brew coffee at a 4,000-square-foot facility in Charlottesville. “Right now, our biggest focus is not necessarily on building more coffee shops, but on scaling our distribution of kegs and cans,” Warshall said. He credits his Darden education with influencing that business decision. When Snowing in Space first started, the founders did not anticipate that so much of its business would come from offices eager to supply their employees with good coffee. Adjusting to that has been a big part of the company’s success, according to Warshall. He’s also relied on lessons learned in Darden’s leadership classes, specifically a required course called “Leading Organizations,” part of the school’s Leadership and Organizational Behavior curriculum. Charlottesville itself has also been an asset. Snowing in Space is one of many food and beverage startups to come out of UVA and the Charlottesville area, including Roots Natural Kitchen – a popular salad shop on the Corner that has now expanded to other states – Random Row Brewery and many more. 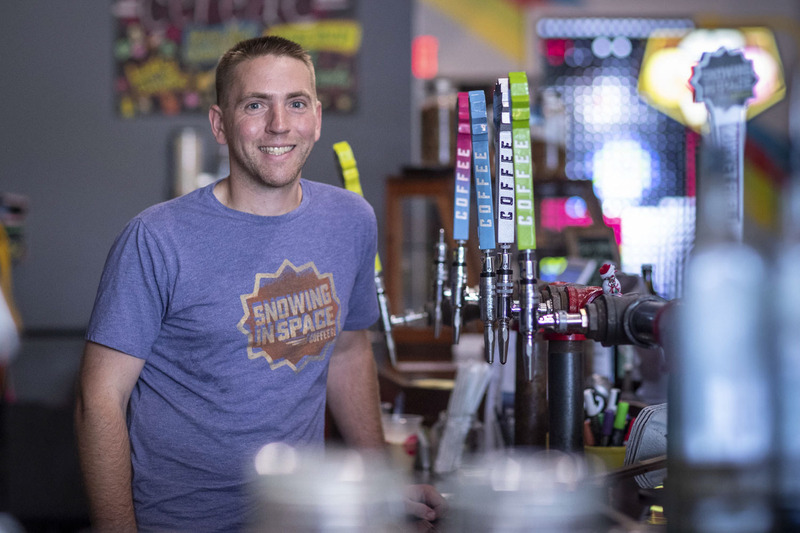 Even as Snowing in Space’s founders looks to grow their business in other Virginia locales and, eventually, expand beyond the commonwealth, Charlottesville and Virginia will always be home.